Guantanamo Naval Base, Cuba – Oral arguments in the Sept. 11 case this week provided details of recorded phone calls allegedly involving Khalid Shaikh Mohammad and three of his co-defendants in the months before the attacks. The government believes the calls involved coded conversations “in furtherance” of the 9/11 conspiracy, and were made between April and October 2001. The revelations came not from the prosecution team but from James Connell, the lead attorney for Ammar al Baluchi, who is Mohammad’s nephew and accused of assisting the hijackers with financing and travel. Five detainees in total face the death penalty for their alleged roles in the attacks that killed 2,976 people. Connell was challenging a protective order – what he called a “gag order” – preventing the defense teams from making any inquiries, including in closed court sessions, that might touch upon the sources and methods of how the recordings were obtained. The prior judge on the case, Army Col. James Pohl, issued the protective order after an ex parte, or private, presentation by the government team. Connell told the current judge, Marine Col. Keith Parrella, that he should rescind the order, which he said was a “Kafkaesque” restriction of his speech that prevented him from even using open source materials to challenge its terms. “It is incredibly overbroad and vague,” Connell said. The government provided recordings and transcripts of the calls to the defense teams in the fall of 2016. However, it is unclear when any agency of the government first learned about the content of the recordings. The summary of the discovery provided by the government only said that the recordings made in 2001 “were later determined to pertain to the planned attacks on Sept. 11, 2001,” according to what Connell read in court. In a related motion, Connell argued that the court’s acceptance of the government summary without cross examination of government personnel with knowledge of the “how” and the “when” of the recordings would violate his client’s constitutional right to confront witnesses. Clay Trivett, a member of the prosecution team, assailed what he described as another defense-side argument that “the entire sky is falling.” While the sources and methods of the recordings are off limits for defense inquiries, the teams will be able to question government witnesses testifying to the meaning of the conversations and the identity of the participants, Trivett said. After court, Connell told reporters that he could not discuss the content of the recordings. He repeated what he said in court: For his team, the recordings could be seen as exculpatory by supporting a contention that al Baluchi was a relatively minor player in the alleged conspiracy. Connell also said the recordings could support his team’s arguments that the U.S. was not at war with al Qaeda at the time of the attacks if the government knew of the location of Mohammad and other alleged conspirators but did not kill them. Whether the U.S. was engaged in an armed conflict with al Qaeda is a critical issue in the military commission. Under the law establishing the commissions, the government will have to prove the existence of an armed conflict at trial before a panel of military officers who will serve as a jury. Defense lawyers claim that a system set up to prosecute war crimes should not have jurisdiction over this case because of the absence of hostilities before 9/11. Mohammad’s team, lead by David Nevin, told Parrella at the outset of these proceedings that his team would not participate. Nevin said that he still had not received enough information about an interrogation last year of a former paralegal for the defense team of Walid bin Attash, who sits behind Mohammad in court. FBI agents interviewed the paralegal in depth about the bin Attash team but also asked about the other teams, according to an affidavit written by the paralegal. Nevin said that the “long history” of government intrusions into the defense teams raised the possibility of a pending investigation that the limited and redacted discovery provided by the government did not resolve. Cheryl Bormann, the lead attorney for bin Attash, also declined to participate. Parrella has already ruled that the attorneys are not operating under a conflict of interest because no current member of any team is under investigation. This week’s pretrial hearing is the 34th in a case that began with the May 2012 arraignment; more than 17 years after the attacks, a trial date is still not set. Though many pretrial motions are pending, the case is in something of a holding pattern as Parrella considers a prosecution request to reverse last year’s blockbuster decision by his predecessor. 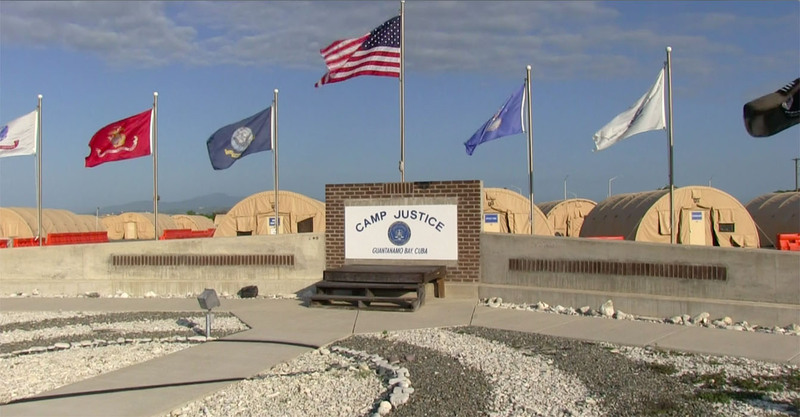 Before departing the case, Pohl prohibited the government from using any statements the defendants made to FBI interrogators in 2007 after their arrival at Guantanamo Bay from CIA black sites. Leaving that suppression in place could set up a lengthy government appeal. Parrella told the parties in a Saturday conference that he was close to making his ruling. Monday was expected to be the only open session this week, with classified arguments set for Tuesday. A former CIA interpreter who mysteriously appeared on one of the defense teams in 2015 is scheduled to testify on Thursday, also in closed court. Connell’s team has challenged Parrella’s decision to close the testimony to the Court of Military Commission Review, which could rule at any time. Connell’s team also pushed forward with its broader effort to undermine the prosecution’s position that the war with al Qaeda began with Osama bin Laden’s 1996 declaration of war. Benjamin Farley, a lawyer on the al Baluchi team, argued that the government should be compelled to provide any communications the Department of Defense had with the International Committee of the Red Cross, or ICRC, which communicates with governments about their obligations under the laws of war. The absence of any ICRC communications until after Sept. 11, 2001, would support the al Baluchi team’s position that the armed conflict began with the invasion of Afghanistan the following month, Farley argued. Trivett told Parrella that the prosecution team had not “inquired” about any of the ICRC communications requested by the defense lawyers. He contended that the organization’s determination about the existence of hostilities was irrelevant to any conclusion that a jury would later have to make.